Engaging God: God help us! Even I can remember a time when, at dark moments – mining disasters, massacres, plane crashes, shipwrecks, plagues, fires and all manner of evils – the leaders of the Christian churches would speak with gravity to give the living comfort and the faithful reassurance. There is no question that well over two thousand years of Christian thinking has failed to solve the theological problem of evil: the lack of intervention by a God in the terrible tragedies that are part of all human life; tragedies that range from the intimately personal – the loss of a loved one to illness, accident or violence – to the great disasters that cost or ruin the lives of hundreds, thousands, even millions of people. This God, who, we are told, is all-present, all-powerful and all-knowing and who loves us all, watches, paring his fingernails and does – nothing. To all this premature death we must add sickness, suffering and pain. Medical science has done much, but the book of human suffering is still a very thick one. William Blake (1757–1827), Book of Job, no. 14, 'Behemoth and Leviathan', c. 1805, The Morgan Library, New York. How can a loving God allow this? All our faith and prayers – to what purpose are they? The faithful rejoice and thank God for every miraculous escape or cure, but ignore the millions more for whom it does not happen. For more than two millennia Christian theologians have wrestled with this problem and got nowhere. The traditional Christian response can only ever be the application of comfort and love to save what can be saved from whatever is left behind. There is nothing more that can be done. Asked if these attacks had caused him to doubt where God is, he said: 'Oh gosh, yes,' and admitted it put a 'chink in his armour'. Leaving aside the theologically odd question of 'where God is', it's a bit of a worry that the leader of the Anglican Church doesn't seem to have already had a position on the central theological issue of the problem of evil. Despite all those millennia of misery he seems to have been taken by surprise by such things. Holocaust? Stalin? Pol Pot? Massacre of the Innocents? 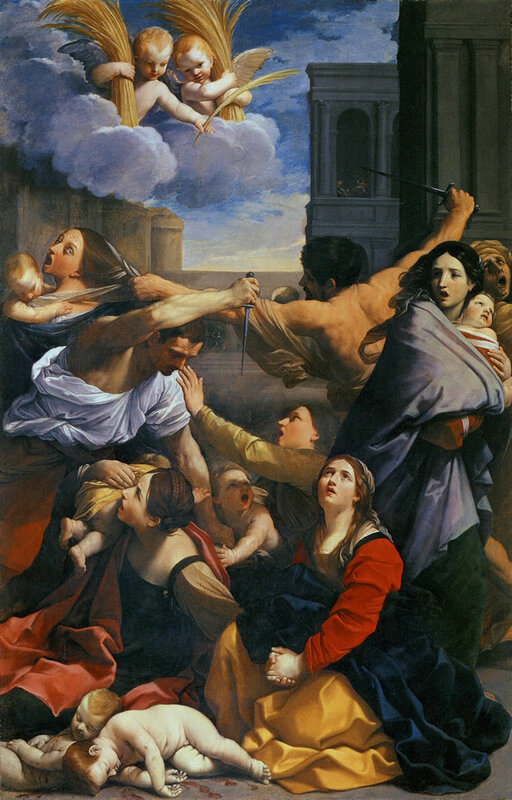 Guido Reni (1575-1642), Strage degli innocenti ('The Massacre of the Innocents'), 1611, Pinacoteca Nazionale di Bologna. Narrative source is the Bible, Matthew 2:16–18. His press release tells us that 'the terrorist attacks in Paris had made him doubt the presence of God'. Our Justin seems to have forgotten that if God exists then He has to be present everywhere all the time. If God chose not to be around in Paris on that day, then, Canterbury, we have a problem, because as far as the victims were concerned, he did not exist for them. It has long been suspected that the upper layers of the Anglican Church do not actually believe in the existence of God. Now we have the proof from the mouth of their leader. Saturday morning, I was out and as I was walking I was praying and saying: 'God, why – why is this happening? Where are you in all this?' And then engaging and talking to God. Yes, I doubt. 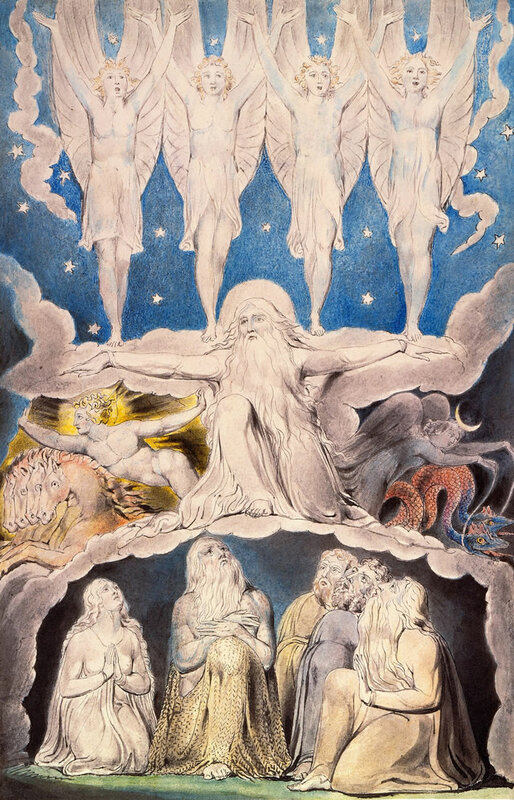 William Blake (1757–1827), Book of Job, no. 14, 'When the Morning Stars Sang Together', c. 1805, The Morgan Library, New York. When the stars threw down their spears / And water'd heaven with their tears: / Did he smile his work to see? / Did he who made the Lamb make thee? 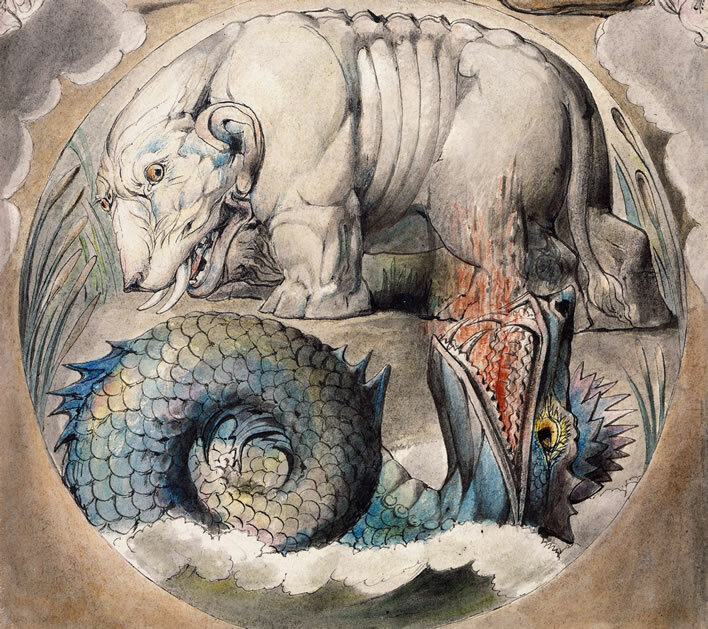 William Blake, Songs of Experience, 'The Tyger', 1794. But this novel way of comforting the afflicted by questioning your own faith – 'Yes, I doubt' – is really quite… well, despicable. It's not about you, Justin, my son. Bit more faith, bit more backbone, bit less engaging. Gird up now thy loins like a man. Do your damned job. ^ The Bible, King James Version, Book of Job, 40:15.